October 9 is the day of the blue cheese- molded cheese. When we hear about eating mold, we are usually scared and afraid that it is dangerous, but if you do not know, mold cheeses have many health benefits. Cheese with mold are cheeses with blue and green spots. 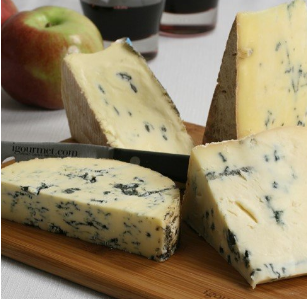 Among the types of cheeses are: Roquefort, Gorgonzola, Steelton, Durbello, Cambazzola, Danbello, Camelost and more. The origin of the mold is not spoilage of the cheese, but cultures of funcillium species, the type of fungi discovered by Alexander Fleming in the 1940s that can inhibit bacterial growth. Just as penicillin-containing drugs are used to treat infections, molded cheeses have the ability to fight infections. The taste of the blue cheeses is sharp and salty and has a strong and unpleasant smell (because of the bacterial cultures). They add good taste to salads, bread, pasta and many other dishes. As we have said before, the health benefits of blue cheeses are many, among which you can find the anti-inflammatory properties they have, which can help them in inflammatory situations such as arthritis and other infections. Other benefits include heart protection, diet help, their contribution to satiety, fighting bacteria, relieving irritable bowel syndrome, preventing bone loss by containing vitamin K2, which maintains bone density, and enhancing the effectiveness of vaccines because they contain catabacillus bacteria. In conclusion, in honor of Blue Cheese Day, go to the supermarket near you, buy moldy cheese and add it to your daily menu to gain good health and longevity!